I created this site to show you interesting things and news around Lex Barker (who else...) which have no other place or are lost easily. Some tidbits I got from other Barker fans, something I found by myself, anyway, it's worth taking a look at them. Some news find their way to this site from the starting site after a while, some are written directly here. You will find a note under Latest Updates, when I add something new. Actor from Introducing Dorothy Dandridge identified! On November 7th unvorgotten actor Brad Harris passed away at a high age of 84 years. He worked with Lex Barker in "Mr. Dynamit - Morgen küßt Euch der Tod", but he is known best for his role of police captain Tom Rowland in the films "Kommissar X". He always kept fit and was interested in the film business. Once more one of those people who knew Lex personally or worked with him is gone. He was very well liked by his friends because of his friendly and humorous character and will greatly be missed by his friends and fans! On Sept. 19th 2017 an event took place in the German Spy Museum in Berlin. Chief Historian Dr. Bodo Hechelhammer talked about the cooperation of the BND (Bundesnachrichtendienst) with the film crew of "Mr. Dynamit - Morgen küßt Euch der Tod". Since I got to know about this event just recently from a barker fan (thanks a lot again!) I couldn't inform you earlier. Some days ago Gustavo Rojo passed away at a high age of 92 years. He was best known by his roles in the German Karl-May movies. His first Karl-May movie was "Old Shatterhand", where he played the villainous Corporal Bush. Further roles (as a good guy) were Lieutenant Potoca in "Treasure of the Aztecs" and "Pyramid of the Sun God" and Ahmed el Corda in "Durchs wilde Kurdistan" and "Im Reich des silbernen Löwen". Gustavo Rojo worked as an actor all the time onscreen as well as on stage. He will greatly be missed by his fans! February 25th 2017: Actor from Introducing Dorothy Dandridge identified! After many years of searching (see here) the name of the actor who played Lex' Tarzan character in the movie "Introducing Dorothy Dandridge" he is identified! In the IMDB he is mentioned as Tyrone Wade. Many thanks to Ted and his friend who dug out and sent me this information! On June 6th 2015 Pierre Brice, longtime bloodbrother of Lex Barker and the one and only Winnetou of the Karl-May movies of the Sixties, passed away in Paris, aged 86 years. Seven times he played together with Lex in the Karl-May movies as Winnetou and Old Shatterhand, additionally in the western "A Place called Glory". All together he played Winnetou eleven times on the big screen, a character which should have great effect on his further life. He will be greatly missed by his fans! On May 2nd 2014 Efrem Zimbalist Jr., one of Lex Barker's best friends, passed away at age 95. In Germany he is best remembered for his roles in the most successful series "77 Sunset Strip" and "The F.B.I.". Efrem Zimbalist Jr.and Lex Barker were of the same age and went to the same school. When in the seventies Lex' career went down Zimbalist offered him a role in one episode of his series "The F.B.I.".. 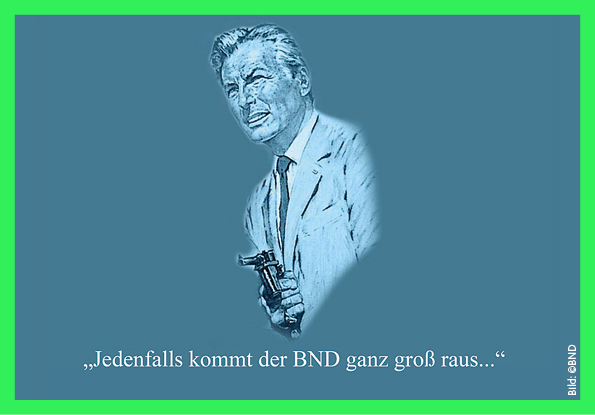 In February 2014 a most interesting publication by the German Bundesnachrichtendienst (BND) has been published, dealing with the making of the movie "Mr. Dynamit - Morgen küßt Euch der Tod" and the contacts between producer and the German BND. You simply have to read it! In 2014 this movie has been released on DVD twice: first by Transit-Film, in December by Pidax-Film, this one containing an interview with Dr. Hechelhammer from the BND as bonus. On November 30th 2013 Chris Howland passed away at age 85. He played the funny sidekick in numerous Karl-May movies which are Lord "Tuff-Tuff" in "Apache Gold", the very british Butler Archie in "Der Schut", "Durchs wilde Kurdistan" and "Im Reich des silbernen Löwen" and Don Parmesan in "Vermächtnis des Inka". He was often invited to different Karl-May fan events where he liked to talk funny tales which happened while shooting these movies. He enjoyed those events and of course he was happy of being still very popular. A wonderful contemporary witness of those days is gone — he and his tales will be missed! Chris Howland on July 2012 at the Karl-May event in Berlin. How you can see I changed the layout hoping you will enjoy the lighter view which I think to be more pleasant to watch. I integrated a special view for mobile phones (upper left, though many newer mobile devices are able to show normal websites — but I just like to play a bit...). Additionally I added a view with high contrast and a bigger font (upper right). I did no changes on the content, just some updates. I wish you fun watching the new barker site! A new page on the official Barker site shows pics of Christopher Barker and Pierre Brice from an interview which was recorded for a TV clip on Lex Barker. See here. On Thursday 27th September Herbert Lom passed away at age 95. He was one of the best Karl-May-Villains and a very good and versatile actor. We won't ever forget his memorable performance as the "Cornel" in the Karl-May movie "Treasure of Silver Lake". The picture shows Herbert Lom writing autographs at the Karl-May movie festival in Bad Segeberg. May 2011: Just in time for Lex' birthday: New edition of "Lex Barker - Die Biografie" has been released! March 25th 2008: Lex has got a commemorative plaque on the "Walk of Fame" in Kanab/Utah! Not yet Hollywood - but a great honor anyway: Lex Barker has got a commemorative plaque on the "Walk of Fame" in Kanab in Utah. More information and pictures are available on the official Lex-Barker website, see here! I learned from an American Barker fan that there is a film named "Introducing Dorothy Dandridge" in which someone playes the role of Lex Barker. This movie is shot in 1999 and tells the life story of black actress Dorothy Dandridge (1922-1956). The leading role is played by Halle Berry. The movie is available on DVD. Isn't he a bit smaller than Lex? Wanted: Who knows this face? Many thanks to Ted for informing me about this movie and sending the pictures! Thanks to Ted and Sibi the actor could be identified, see here! Many thanks to both fans who send me new infos from time to time! Well known director Franz Josef Gottlieb passed away on July 23rd 2006 in Verden at age 75. He directed the Karl-May movies Durchs wilde Kurdistanand Im Reich des silbernen Löwen as well as Mr. Dynamit - Morgen küßt Euch der Tod. Furthermore he shot numberous movies, mainly for TV. He directed TV series as well such as "Unser Charly" or "Der Landarzt". A detailed filmography can be found here. I met Herrn Gottlieb at the Karl-May-Fest 2002 in Bad Segeberg, where he was honoured with the "Scharlih"-Award, an award for people connected to the work of Karl May. He was a very nice man who could of course tell a lot of stories about his work. He told for example about an argument with Artur Brauner (Producer of the Karl-May-movies Gottlieb directed) about his salary. Gottlieb had written the script as one unit but Brauner made two films of it. However he wanted to pay Gottlieb and the whole crew only for one film. Gottlieb and Lex Barker had a long lawsuit with Brauner which they won years later. Franz Josef Gottlieb will stay in our memories as a skilled director, a warmhearted, decent and friendly man as well as - last but not least - as one of the rare people whe worked with Lex. He will be missed. 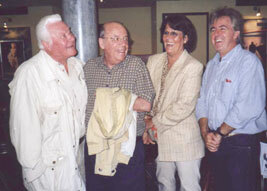 The picture shows (left to right) Franz Josef Gottlieb, Chris Howland, Frau Howland and Thomas Winkler an July 28th 2002 at the Karl-May-Fest in Bad Segeberg.